Flowers run in Natalie Bowen Brookshire's family--her mother is a garden designer, and her grandmother once owned a floral shop. But at first, Brookshire resisted the call. "I wanted to work in an office and wear a power suit," she says. "Turns out I need to work with my hands, and I'm not great with computers." 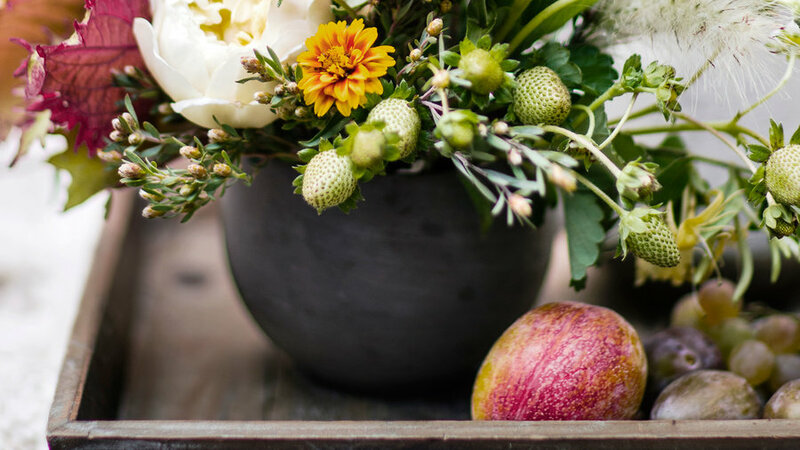 Opening her own floral design studio in San Francisco in 2003 was the right move; Brookshire is now one of the area's most sought-after florists, known for her free-flowing seasonal arrangements (). Behind her design studio, Brookshire plants greenery like abutilon, fern fronds, jasmine, and fuchsia to clip for bouquets. Mostly, though, she uses the small backyard to host parties, from impromptu cocktail hours to giant birthday bashes. Whatever the event, Brookshire views it as a happy excuse to pull out the vases. 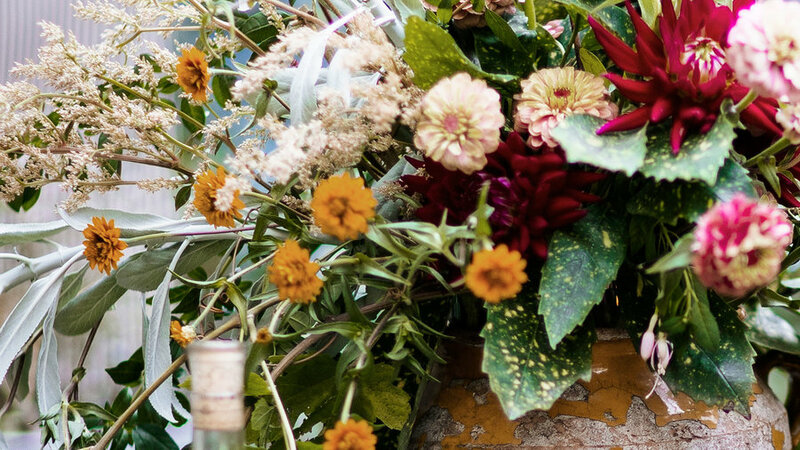 "Flowers automatically make it feel like a special occasion," says the designer. "I put down an arrangement and the whole space comes alive." When shopping for blooms, make the farmers’ market your first stop, says Brookshire. “Flowers are freshest there because they’ve passed through the fewest hands.” In San Francisco, she also loves the city’s flower mart and . 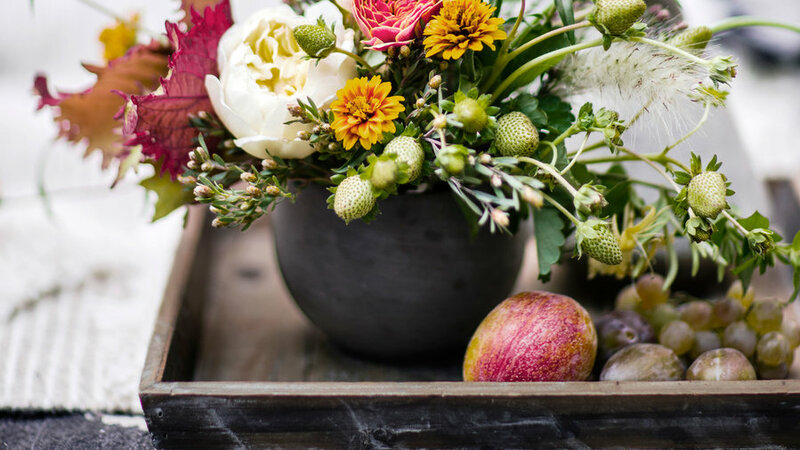 As she shops for ingredients for bouquets, she lets the season lead. “I choose whatever flowers catch my eye,” says Brookshire. “It’s usually something I’m just starting to see for the first time in a year.” Here, she’s mixed dahlias, zinnias, and garden roses. Pillows from . and . 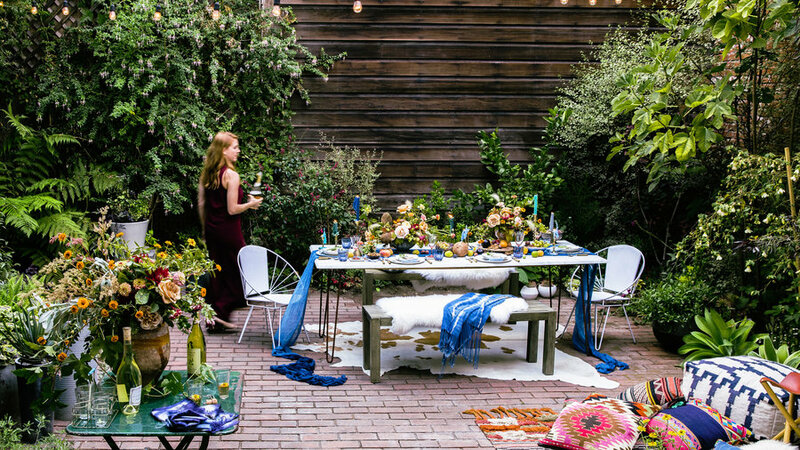 Even in her small yard, Brookshire likes to create different areas for mingling--a main table, a small bar, a lounge--each punctuated with a distinct floral arrangement. 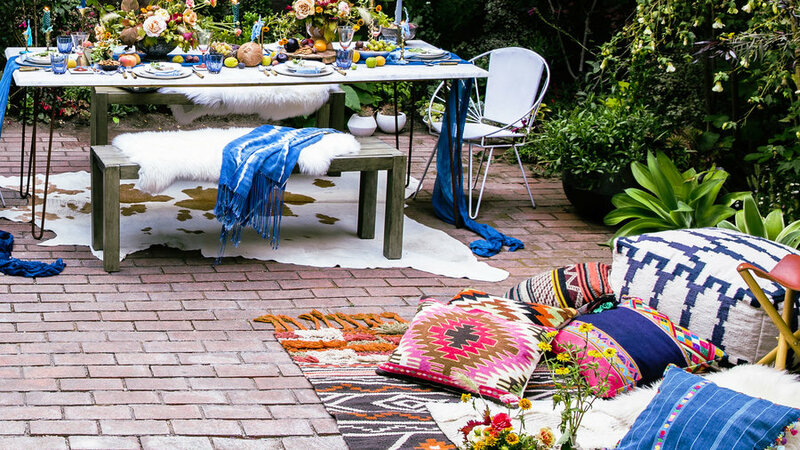 For the decor, she’s of the “use what you’ve got” camp, bringing out rugs, pillows, and blankets from her house (including the indigo throw used as a table runner here). 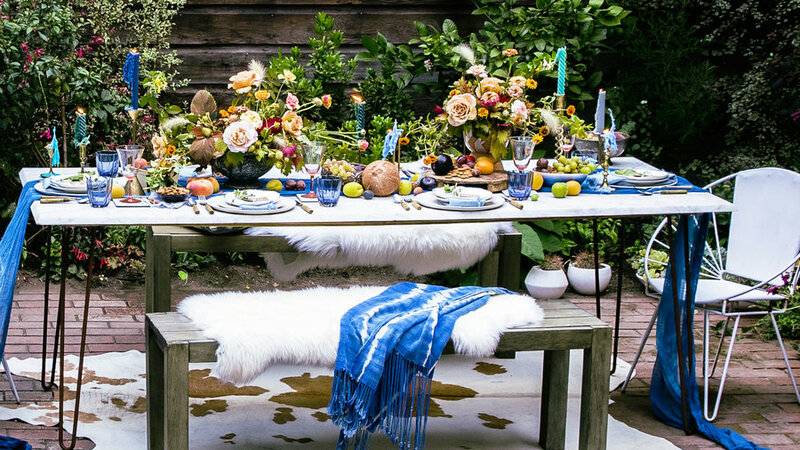 Blue-and-white table settings show off the “juicy hues” of summer flowers, says Brookshire. 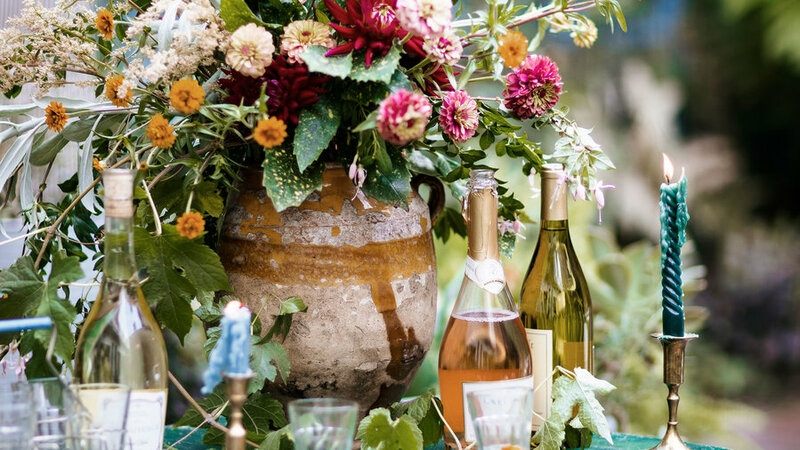 With a dramatic arrangement pouring out of an urn, Brookshire turns a side table for drinks into a show-stopper. “It doesn’t take much to transform a simple surface into a giant moment,” she says. This bouquet features the dahlias and zinnias used elsewhere in the yard, plus a few new goodies, including grass seed heads and a cascading grapevine. Place branches and heavier stems in the vase first. They hold up the more delicate stems without breaking them. a tray provides a stable surface for Brookshire to create a ground-level arrangement. The petite bouquet features two-toned purple and green coleus, as well as some unexpected players: un-ripe strawberries that dangle from the vase, and plums and grapes surrounding it. 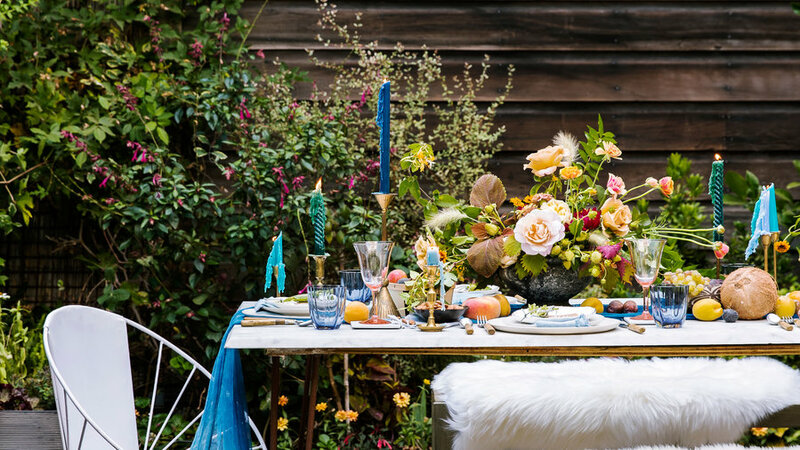 Using edibles in tablescapes is one of the designer’s favorite ways to amplify the sense of bounty. “If your garden’s tomatoes are looking amazing, go ahead and use them as part of the decor,” she says. Get a head start on party prep: Brookshire says you can safely buy and arrange flowers two days in advance--just change the water daily.